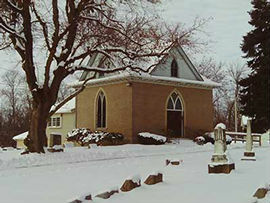 The chapel was erected in 1905 by Greenlawn Cemetery Association prior to the establishment of local funeral homes. 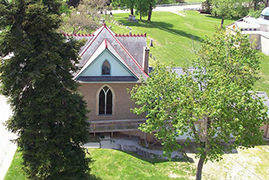 Services were held in the Chapel before the deceased was taken to the grave site. At the conclusion of the funeral services, the casket was then lowered through an opening in the floor and placed on an awaiting casket-bearing wagon for transport to the gravesite. During colder winter months, when grave digging was difficult, if not impossible, the caskets were stored in the basement until weather permitted burial at the gravesite. In the 1990's, the Chapel was renovated with funds given by Myron and Paul Barnes, following Myron’s death; hence the Chapel was rededicated in their honor. At the time of this renovation, the aforementioned opening was closed permanently. Interior work was performed and the antique organ was added after it was properly restored to working condition. Bathroom facilities were also added for the conveniences of those who use the building for final services. The Barnes Chapel can be used for funeral services at no charge. Mausoleum: By definition a mausoleum is an above-ground burial structure that can be entered like a building. These structures are almost always made of stone and are expensive to construct. Individual burial cells or chambers in a mausoleum are referred to as loculi (from the Latin word loculus, meaning small compartment). Mausoleums usually contain family members and most often have four or more chambers. Mausoleums may contain both bodies and cremated remains. In urban cemeteries, mausoleums are sometimes large buildings containing hundreds of loculi. 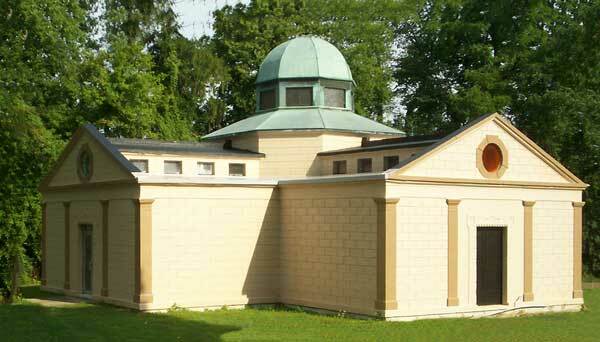 Located north of the main entrance gates and completed in 1910, this mausoleum was privately built by J. B. Ehrenfried. Throughout the years, it was popularly referred to as Greenlawn Mausoleum but this reference was based on its location only, as it was not part of Greenlawn Cemetery Association, but a private burial association. 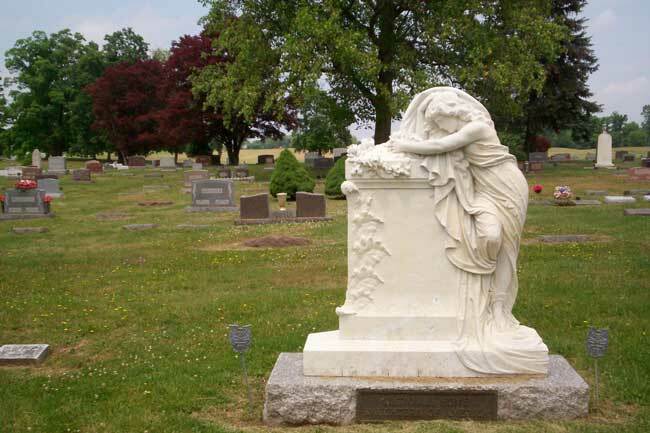 In the 1990’s, Charles Meyers, a descendant and heir to the mausoleum records approached Greenlawn Cemetery Association and the board agreed to assume ownership of the structure and promote mausoleum burials. Greenlawn has restored the exterior and replaced the roofs. The two uppermost roofs are made of copper. Both the JOUAM and the Daughters of America are descended from t e Order of United American Mechanics, founded in 1845. The Junior Order of United American Mechanics, as its name suggests, was meant to be the youth affiliate of the Order. The OUAM founded a ladies auxiliary, t e Daughters of Liber y in the 1870's. The JOUAM split from the OUAM in 1885. The Daughters of America was still thought to be in existence as late as 1997. Originally, the order was open to white American women over 16, as well as members of the JOUAM. Later, in a pamphlet described as "recent" in 1979, the order was described as open to "PATRIOTIC, WHITE MALE AND FEMALE CITIZENS OF GOOD MORAL CHARACTER, WHO BELIEVE IN A SUPREME BEI G AS THE CREATOR AND PRESERVER of the Universe and who favor the upholding the American Public School System and the reading of the Holy Bible in the schools thereof, must be opposed to the union of Church and State; must be literate and capable of giving all the secret signs and words of the Order, or of explaining them if unable to give them by reason of some physical misfortune or defect." In 1923 the Daughters had slightly more than 115,000 members in 32. By 1930 the organization reported having over 160,000 members in 33 states. Its membership numbers were reduced to about 19,000 in 26 states by 1978. The Daughters of America was organized on three levels. Local groups were called Councils, state groups were called State Councils, and the overall structure was called the National Council. Its headquarters was located n Harrisbur Ohio o in 1979. In 1923 there were 1,000 local Councils. The Daughters had a ritu l which it still was very serious about keeping secret as late 1970. They were also strict about not discussing its business outside the Council rooms. In 1907 the Daughters of America created a Funeral Benefit Department. The organization also operated a home for the elderly n Tiffin, Ohio. Those members wishing to reside there had two options: turn over all their income and properties to the home or join a "contributing plan" which required a monthly fee of $275. Any member 62 or older who had been a member of the order for at least fifteen years was eligible to stay at the home. Instead of an orphanage, the Daughters of America created an early form f foster ca e called the "Helping Hands System". A manager would find suitable homes for the children and a stipend for their support was paid out of the funds of the department, raised by voluntary contributions from the local branches. By the 1970's this had evolved into a financial aid toward the education of children under 18 in the event of the members death. 8. Establishing funds to provide for the aged and infirm members of the order. 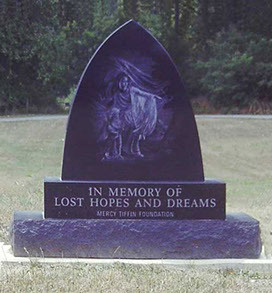 In conjunction with the Mercy Tiffin Foundation, Greenlawn has erected a beautiful marker “In memory of lost hopes and dreams” for children up to 24 months of age including fetal deaths. To either side of the marker is a “ribbon” of concrete which serves as a foundation for markers for the deceased children. At present the fee for burying a child here is $150 which includes the foundation for the marker purchased by the family. Regarding fetal deaths: In 2008 the State of Ohio passed the Grieving Parent’s Act which defines what constitutes a “fetal death” and what rights the parents have. For more information, click here. For an Early Pregnancy Lost Form, click here.